Reflections on giving: Should we listen to our gut when we give to those in need? 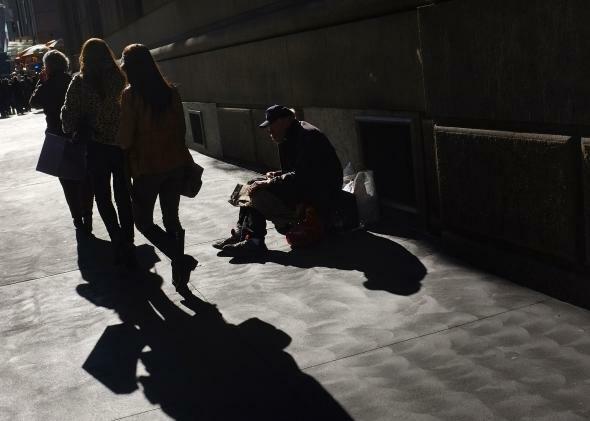 Women walk by a panhandler in Manhattan. While experts say it’s better to give to a food bank or other charity, sometimes helping people directly helps us realize our own generosity. One Sunday winter afternoon, I attended a concert by the Dessoff Choirs titled “Sing-In: Bach’s Prayer in B Minor,” with the original Catholic Mass in Latin transposed into Jewish theological ideas in Hebrew. It is not the kind of event I usually attend, but a friend was affiliated with the group. There was a strange blend of highbrow culture—18th-century music sung in a transliterated ancient language—and communitarianism—voices, trained and untrained, joined in a project that bridged two worlds. Walking into the New York chill afterward, I considered hailing a cab to get home, but the subway was right at the corner. I spotted a sort-of empty seat—sort of because the passengers on both sides had colonized some of the space. Wanting to read, I squeezed in. I perched forward, irritated that neither of my seatmates budged to give me more room. I’d just begun reading when a shrill voice drew my attention away. A woman with dirty hair pulled tightly back into a ponytail that made her forehead look too large and her eyes too small was standing by the door, launching the woe-unto-me lament to which New York subway riders are inured, staring at our shoes during the ensuing a capella/harmonica/Peruvian flute performance and the inevitable passed cup. This time, though, I couldn’t ignore the petitioner. She was weeping. I’d never before heard a panhandler express the humiliation so many must feel. It felt strangely postmodern, like an actor proclaiming that it’s weird to pretend to be someone else. I examined her lined and splotchy face, her bulky body—guessed weathered 30s, though she could have been a decade older or younger. Still stuck on the image of a person with bugs crawling over her, I now noticed the woman’s chipped tooth. She was trying to get back to the husband who’d abused her? But we know this is what happens: Women go back to the men who smash their teeth. Particularly women who have nowhere to sleep save on a floor next to someone with bugs. Hadn’t she said she was trying to get home? We’ve all heard vitriol directed toward panhandlers—reports like Fox Business Network’s John Stossel’s indignant account of having posed for a few hours as a panhandler during which he earned what he extrapolated would be $23,000 tax-free a year. (His experience runs counter to the findings of a survey of San Francisco panhandlers that showed 60 percent made $25 a day or less, and 82 percent were homeless; 44 percent admitted using money collected for drugs and alcohol, but 94 percent reported using it for food.) And, we all know the argument, including from advocates for the homeless, that there is greater cost-benefit to a dollar sent to a food bank than dropped into a paper cup. The woman was beginning to move from person to person. If I had to place a bet on whether she was actually three months pregnant, I’d have to say no. If I had to place a bet on whether she had a husband who’d abused her, I’d have to say even odds. But if I had to place a bet on whether she’d recently slept on the floor next to someone crawling with bugs, I’d bet yes. Yes that she wanted to sleep in a clean bed. Yes that she was desperate. Yes that she was weeping. I would give her a dollar. A dollar isn’t much, but it’s pretty much what I give anyone who asks and who I let catch my eye, which is usually someone every day. Maybe I was being taken. Maybe her next stop would be a dealer or liquor store. But I didn’t think so. I unzipped the little pouch I was carrying as a wallet. Inside were my Metro card, my American Express card, a $20 bill, and some change. No quarters: just pennies and dimes. The woman was approaching. I kept my head bowed, fighting back a creeping panic. What should I do? She’d already seen me reach into my bag. To give her pennies and dimes, what looked to be 28 cents, seemed worse than not giving her anything. Like a slap in the face. Like Marie Antoinette saying Let them eat cake. With my seatmates still unbudging, I was pitched into the aisle. The woman was now inches from me. She bent forward slightly at the waist. I looked up, at her lined skin, her chipped tooth, her red nostrils. I handed her the $20. Her eyes opened wide. Her lips parted. Tears flowed down her cheeks. She touched my hands, my wrists. In fairy tales, the same story is told over and over. A poor old man sits by the side of the road. The greedy, unfeeling, wealthy daughter passes him by, but the kindly impoverished stepsister shares her bread and water. The poor old man is transformed into a prince, who then marries the kindly girl. Now, though, I felt mortified. God bless me for not giving a weeping woman 28 cents on my way from a sacred music concert to my warm, bug-free apartment? For having only a $20 bill in my wallet? When I got out of the subway, I cleaned my hands and wrists with the hand-sanitizer in my bag, ashamed that I felt the need to distance myself from the almost primal connection I felt to this woeful woman, to ward off the bugs she had described, the germs I imagined her harboring. At this time of year, many of us struggle with questions related to giving: To whom should we give, how much, in what way? Whereas for some, this is a religious matter, for most of us, we follow our guts as we decide what to give in gifts or tips or canned goods or checks or our time. How, though, do our guts work? Philosophers and social psychologists have for some time now been interested in this question with respect to moral decisions. A branch of study called “trolleyology,” named after “the trolley problem,” has emerged that examines the influence of different variables in different decision scenarios. In the trolley problem, a person must decide whether to pull a switch that will divert an out-of-control train from running over five people tied to the tracks but will lead to the death of a solitary tethered victim on the other track. In a variant called “the footbridge problem,” the decision is whether to push a fat man off a footbridge, his corpulent body halting the train and thereby saving the tethered five. The death count is the same in both scenarios—one dead, five saved—yet most people would pull the switch but would not push the fat man. Perhaps most of us would not push the fat man because it means crossing a line that threatens our own humanity too. So, in my view, it is with looking away from the panhandler, with ignoring her plea. I accept that it is more efficacious to give a check for $365 to a food bank than to hand a dollar bill each day to whichever panhandler happens to catch my eye. With each of those dollar bills, though, more transpires than money moving from one pocket to another. The bridge goes both ways. Perhaps we stop a stomach from grumbling, perhaps we spark a feeling of hope—but we also nourish our own capacity for generosity. We enlarge our ability to imagine other lives. Yes, it is possible the woman on the subway would use the $20 to get a fix or a drink or some pills—and if I had her life, I might do the same. Still, I believe her that she also wants a clean, safe place to sleep. We all do.